The killing of many people by the military in the city of Andijan in Uzbekistan (see The Independent) places yet another uncomfortable spotlight on the foreign policy of the United States. In this year's State of the Union speech, President George W. Bush declared: "America will stand with the allies of freedom to support democratic movements in the Middle East and beyond, with the ultimate goal of ending tyranny in our world." With respect to this position, critics will point to a number of undemocratic tyrants which are supported by the United States. On top of the parade is Uzbekistan and its President Islam Karimov. In spite of an appalling human rights record (see The Guardian and US State Department), Uzbekistan receives more than 100 million US dollars in foreign aid and allows the United States to access an airbase in Uzbekistan in return. Arlington, Va.: Has there been any confirmation of the reports that the Uzbek government has boiled opponents ? I know this sounds pretty strange, but the rumor is out there and would be pretty gnarly if so. However, we must deal with many countries that do not have democracies, constitutions, the prohibition on cruel and unusual punishment and a whole host of other things we find objectionable - if it is in our interests. Either that, or change some of our interests and that can be inconvenient. Sure it would be great if everyone could be free, but sometimes that can be pretty risky to some of our interests. Cruel and unusual is somewhat ambiguous anyway. C'est la vie. Jefferson Morley: I haven't heard about boiling but human rights groups both in Uzbekistan and abroad are consistent in reporting torture as a routine practice in Uzbek jails. "C'est la vie" seems a callous reaction to a government's policy of torture. If you or your relatives were being tortured, what would you say to someone who said "That's life?" The elderly mother of a religious prisoner allegedly boiled to death by Uzbekistan's secret police has been sentenced to six years in a maximum security jail after she made public her son's torture. Fatima Mukhadirova, 63, a former market vegetable seller, is the mother of Muzafar Avazov, who died in the notorious Jaslik high security jail in 2002. She was convicted of attempting to "overthrow the constitutional order". An Uzbek judge yesterday said she had "set up an underground cell of women propagating the ideas of [banned Islamic fundamentalist group] Hizbut Tahrir". The secret police had found "incriminating" pamphlets in her flat, a common occurrence in arrests of group members. The British ambassador to Tashkent, Craig Murray, last night told the Guardian: "This is appalling. She took photographs of her son's corpse which she gave to the British embassy. The Foreign Office sent them to the University of Glasgow pathology department. Their forensic report said the body had clearly been immersed [in boiling water] because of the tide marks around the upper torso." He said that Ms Mukhadirova's continuing campaign seemed to explain why she had been targeted by the authorities. She now had a sentence of hard labour. "The chances of her surviving that are very limited," he said. Here are two of those autopsy photos of Muzafar Avazov (WARNING: Extremely gruesome): Photo 1 and Photo 2. After having looked at the photographs, would you believe that this was the result of a tea fight among prisoners? As reports continued to come in of clashes spreading outside the town of Andizhan, a sergeant in charge of the bridge at the border village of Kara-Suu said he believed that 2,000 had been massacred during three days. There is no way to confirm numbers offered by refugees, but it seemed likely that when the truth emerges, the massacre in Uzbekistan, an American ally in the fight against terrorism, could become the deadliest assault on civilians since the Tiananmen Square massacre in 1989. ... An Uzbek Opposition party said it had compiled a list of 745 people killed. Uzbekistan’s prosecutor general said the toll was 169. "Some people said that two hundred died in the Square and others claimed that two thousand died. There were also stories of tanks running over students who were trying to leave. I have to say that I did not see any of that. I don't know where those people did. I myself was in the Square until six thirty in the morning. I kept thinking, are we going to use lies to attack an enemy who lies? Aren't facts powerful enough? To tell lies against our enemy's lies only satisfies our need to vent our anger, but it's a dangerous thing to do. Maybe your lies will be exposed, and you'll be powerless to fight your enemy." Hou Dejian. This is a cacophony of opinions over how many were people killed at Tiananmen Square (or, more importantly and not addressed in the quotes above, in the city of Beijing around the same time)? 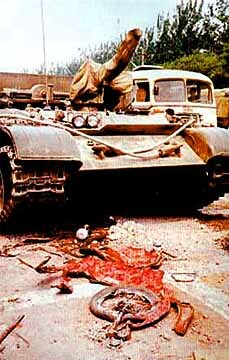 Here is just one photo (WARNING: Extremely gruesome) after a bicyclist encountered a tank in a Beijing street: Photo. After having looked at the photograph, would you believe that nobody died on that day? Or that this particular death was anything like 'normal'? Of course, once again, such a photo might 'upset' the beautiful minds of some people and instead we get bogged down with a lot of words instead. Reference: Uzbekistan: Tea Fight! Musing Under The Tenement Palm.